The name Ōkuninushi (great-land-master) was given to represent the entire range of the kami’s attributes as lord of the Central Land of Reed Plains. The name is not found in the main text of Nihongi or fudoki. 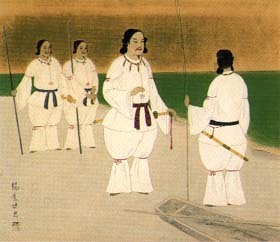 According to Kojiki, Ōkuninushi accompanied his eighty cruel brothers on their way to woo the maiden Yagamihime in Inaba Province. 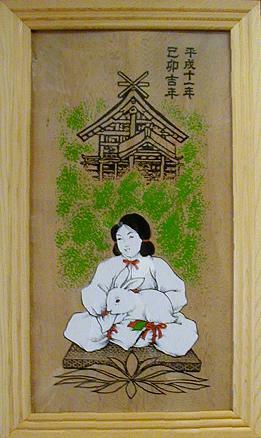 On the way, Ōkuninushi aided a rabbit whose skin had been stripped off by an animal called a wani (probably referring to a large shark). Yagamihime chose to wed Ōkuninushi instead of his older brothers, causing jealousy among the brothers, who then twice killed Ōkuninushi. Each time he was killed, Ōkuninushi was revived by his mother, and he finally escaped to the underword Ne no kuni. There, Susanoo, lord of the underworld, posed various trials, all of which Ōkuninushi succeeded in passing with the help of Susanoo’s daughter Suseribime. Taking Susanoo’s divine sword, koto (harp), and bow and arrow, Ōkuninushi returned to the visible world with Suseribime as his new bride. Ōkuninushi used the power of the magic weapons to defeat his brothers, thus becoming lord of the Central Land of Reed Plains, and with the cooperation of Sukunahikona, he engaged in the work of firming the land. After Sukunahikona departed, Ōkuninushi enshrined the kami Ōmononushi in Mt. Miwa of Yamato and continued the development of the land. Later, Ōkuninushi transfered his control over the land to Takemikazuchi (see kuniyuzuri), who had descended from heaven with the command to pacify the Central Land of Reed Plains; with this act, Ōkuninushi retreated to the “world of shade” (yūkai). 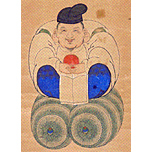 From the medieval period, Ōkuninushi was identified with the popular deity Daikokuten, since the characters forming their names shared the same Sino-Japanese reading. Ōkuninushi is enshrined at Izumo Taisha and other shrines. “Izumo Shinkō is the faith centered around the shrine Izumo Taisha in Taishamachi, Shimane Prefecture. The “enshrined kami” (saijin) Ōkuninushi has many variant names or titles modifying those names, and from these we know that he was worshipped as, among other things, an earth kami, as the king or possessor of the land of Japan, and as a kami of land reclamation and agriculture. From the distribution of legends concerning the kami associated with Ōkuninushi in the Izumo no kuni fudoki (733) we can see that the cult of Izumo encompassed the entire Izumo region. Until the Bakumatsu Period, Izumo Taisha was generally referred to as Kidzuki Taisha, and the shrine’s foundation legend (which describes Ōkuninushi’s “relinquishing the land” (kuniyuzuri), accompanied with the construction of a tremendous shrine) seems to reflect the historical unification of the Japanese nation. There are, however, many theories concerning the era of the shrine’s founding, and no definitive interpretation has been settled upon. The officiant of Izumo Taisha, the “governor of Izumo” (Izumo kokusō – also read as kuni no miyatsuko), worshipped both his traditional “clan kami” (ujigami) at Kumano Jinja (the present-day Kumano Taisha) and also at Izumo. From the Nara Period into the first half of the Heian Period, every time a new kokusō took office, he would travel to the capital and recite the norito “Izumo no kuni no miyatsuko no kanyogoto.” At first the central government regarded Kumano more highly than Izumo, but from the second half of the Heian Period, Izumo Taisha became an ichinomiya, and its land holdings were increased, numbering twelve towns and seven seaside villages in the Kamakura Period. At the end of the medieval period, the amount of rice garnered from these holdings amounted to about 5,400 koku, but in 1591 the shrine was stripped of all but five towns and two seaside villages, in order to fund Mōri Terumoto’s dispatching of troops to the Korean Peninsula. Except for an increase of “fields that provide rice offerings” (saiden) and of lands to provide for shrine repairs, Izumo didn’t recover the lost tribute land until the Bakumatsu Period. Activities of oshi (shrine priests who guided and hosted pilgrims) related to Izumo Taisha date back to approximately 1532 ~ 1555 but it is thought that the economic problems cited above explain the sudden increase in their activity. In many regions there is a legend that the kami gather at Izumo during the tenth month of the lunar calendar. At Izumo this month is referred to as kamiaritsuki (the month when the kami are present). In accordance with this legend, the tenth month was referred to as kannadsuki (the month when the kami are absent) throughout the rest of Japan. An early example of this term can be found in the Ōgishō, written in the first half of the twelfth century, and the term kamiaritsuki appears in the Kagakushū, written in the Muromachi Period (1444). These terms spread widely in the first half of the sixteenth century due to such texts as the yōkyoku (Noh script) Ōyashiro. These legends probably derive from local customs of greeting and seeing off the “kami of the rice paddy” (ta no kami) and from igomori festivals (abstinence and confinement to purify the self before religious events). Rites for the gathering of kami are also conducted at the shrines Sada Jinja and Kamosu Jinja in the Matsue area, but Izumo Taisha’s Kamiari Festival became particularly famous. 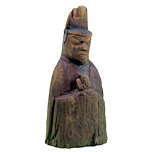 The cult of enmusubi (connecting romantic couples or enabling marriage) through the kami of Izumo seems to be an early modern development created by the activities of oshi.